BMW Motorrad and the legendary RS production bikes – a model badge that continues to symbolise travel and sport in equal measure. In 1976, the R 100 RS became the first mass-produced motorcycle in the world to come with a full, frame-mounted fairing that had been developed in the wind tunnel. As the consummate all-rounder for both travelling and sporting deployment, it established the sports tourer segment, as it has been known ever since. With the arrival of the new R1200 RS, BMW Motorrad is continuing this long tradition by unveiling a sports tourer powered by a flat-twin engine that succeeds in transposing the all-round qualities of the original BMW RS concept into the modern day to stunning effect. Whether darting along country roads, revelling in its dynamic performance with a passenger on board or going on a long touring holiday – the new R1200 RS takes sports touring to a whole new and truly thrilling level. The flat-twin boxer engine on the new R1200RS is the same DOHC drive unit that already powers the R1200 GS, R1200 GS Adventure as well as the R1200 RT and the new R1200 R. It produces 92 kW (125 hp) at 7,750 rpm and develops its peak torque of 125 Nm (92 lb‑ft) at 6,500 rpm. Compared to the engines on the GS, GS Adventure and RT, torque has actually been increased slightly at low revs. The exhaust gases are routed through a 2-in-1 exhaust system with a rear silencer that is steeply angled for dynamic effect. A modified airbox, newly shaped air intake snorkels and a centrally positioned radiator all lend themselves to a slender, sporty and dynamic-looking front silhouette. For optimum adaptation to the rider’s individual needs, the new R1200 RS already comes equipped as standard with the two riding modes “Rain” and “Road”. Besides ABS, the standard specification also includes Automatic Stability Control (ASC) for increased handling safety when accelerating. And, with the optional Riding mode Pro feature, the new R1200 RS also adds Dynamic Traction Control (DTC) with banking detection as well as two extra riding modes – “Dynamic” and “User” – to its technical repertoire. A new tubular steel bridge frame incorporating the flat-twin engine as a self-supporting element was purpose-developed for the new R1200 RS. With an upside-down telescopic fork at the front and EVO Paralever at the rear, the wheel suspension adopts the classic chassis technology of dynamic sports tourers, but updated in typical BMW Motorrad fashion. Excellent steering precision, directional accuracy, neutral handling and braking rigidity were all a top priority when configuring the chassis. All while never losing sight of the overriding objective for the new R1200 RS of creating an exceptionally dynamic RS model for the keen rider, whose design language has been derived from the S1000RR superbike. Opting for the latest generation of the electronically controlled suspension Dynamic ESA (Electronic Suspension Adjustment) takes the dynamic riding experience to even greater heights. With its two damping settings, “Road” and “Dynamic”, Dynamic ESA enables the rider to enjoy unprecedented levels of handling safety, performance and comfort, as the damping is automatically adapted to the prevailing riding conditions to suit the riding situation and the manoeuvres being carried out. Even the instrumentation of the new R1200 RS takes a quantum leap into a new sports touring era. The speed is displayed in traditional fashion by an analogue speedometer, but there is also a TFT display for showing a wide array of information. The BMW Motorrad RS models have always enjoyed a reputation for being the perfect all-rounders. 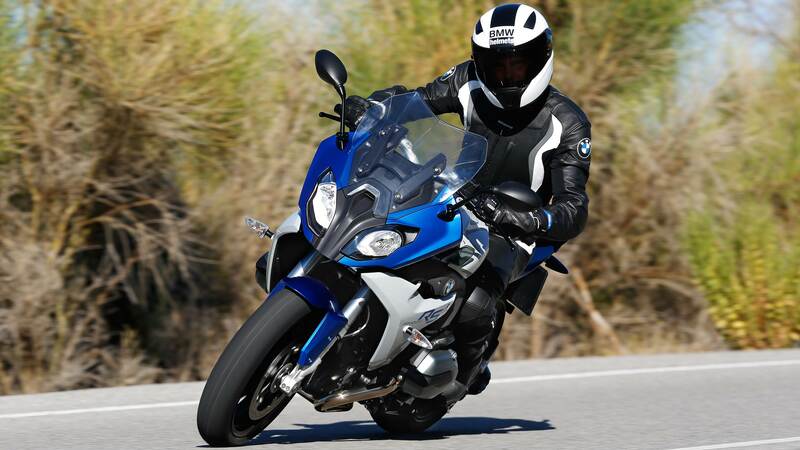 The new BMW R1200 RS fuses these credentials with both sharp performance and a sporty, dynamic design. The aerodynamically styled semi-fairing with twin headlights forms the “face” of the new BMW R1200 RS and makes the fusion of tourer and sports machine plain to see. The dynamic proportions, with the low-set front and the delicately styled tail jutting up at the rear, give the bike a slight wedge shape and leave no doubt as to its sporting prowess, along with its many other talents. Two colour and finish variants each underline the powerful character of the new R1200 RS, but in their own individual way. This results in a choice of two different styling variants: the classically sporty basic colours Lupin blue metallic / Light grey metallic and the sporty and exclusive “Style 2” variant in Granite grey metallic matt. Sporty and dynamic sports tourer design. Key less Ride for supreme ease of use as an ex-works option. Innovative colour scheme with two individual characters, classically sporty in the basic colours and sporty and exclusive in the “Style 2” variant.